Sweet and savory tagines are quite popular in Morocco, with a great number of them including fresh or dried fruit as key ingredients. In this Moroccan recipe, chicken is stewed with tomatoes, chickpeas, and raisins in a spicy, fragrant sauce seasoned with ginger, cinnamon, saffron and Ras El Hanout. In a heavy-bottomed pot, mix the chicken, onions, garlic, oil, butter, and spices. Cover and cook over medium heat, occasionally stirring, for 15 to 20 minutes. Add the tomatoes, parsley, and cilantro. Cover and continue cooking over medium heat, occasionally stirring, for another 20 minutes. A rich sauce should form. Adjust the heat if necessary to keep the chicken from sticking to the bottom of the pot. Add the raisins, chickpeas, honey (and ground cinnamon, if using) to the pot, along with enough water to cover the chickpeas. Continue cooking for another 10 to 15 minutes, or until the sauce is quite thick and the chicken is very tender. Transfer to a serving platter, and if desired garnish with a sprinkling of freshly chopped cilantro. If cooking this dish in advance, note that the chickpeas and raisins will continue to absorb the liquid. When reheating, you may need to add a little water to thin the sauce and return it to its original consistency. Cooking time is for the use of conventional cookware. Allow double the cooking time if preparing the dish in clay or ceramic tagine. The dish may be prepared as described using a tagine placed on a diffuser over medium-low to medium heat. You will need to allow additional time for bringing the ingredients to a simmer, as well as an additional 10 to 15 minutes of cooking time at each step. 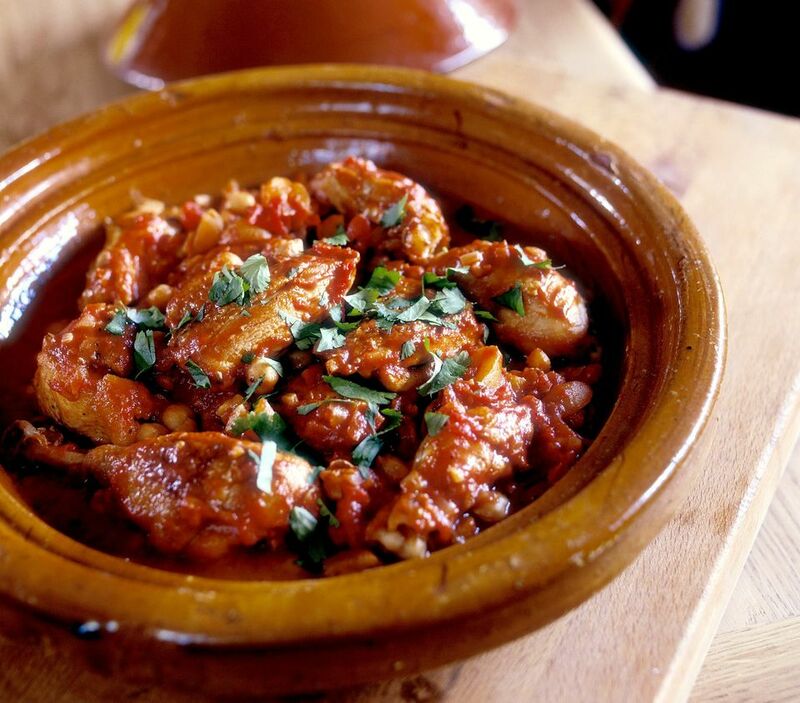 Although you can eat with a fork, most tagines are traditionally eaten by hand. Crusty bread is perfect for this purpose. In Morocco, dense, chewy khobz is the bread of choice for dipping in and scooping everything up. Although not traditional, you can also serve the tagine over couscous or rice. If you like, a handful of dried apricots can be substituted for the raisins. If they aren't soft enough to pinch in half, boil them until tender and drain before proceeding with the recipe.